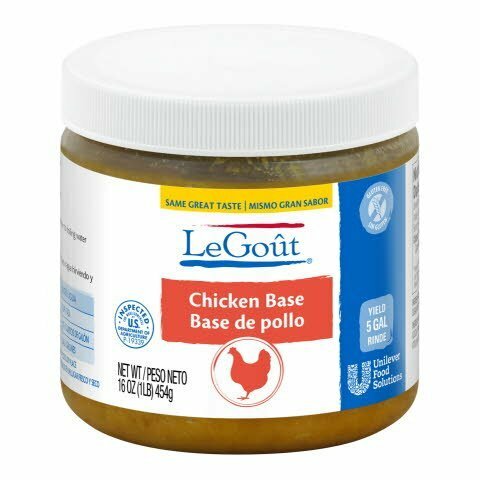 Cooked chicken (mechanically separated chicken and chicken meat), salt, monosodium glutamate, sugar, chicken fat, natural flavors, modified tapioca starch, extractives of turmeric (color), soybean oil. CHICKEN SOUP: Add the contents of this container to 5 gallons of boiling water. Add other ingredients as desired. OTHER SOUPS: To soup prepared as above, add desired amount of well drained, cooked egg noodles, or cooked rice. To prepare cream of chicken soup, add desired amount of LeGoût® Chicken Base to a hot, medium white sauce. This meat first base adds rich chicken flavor to dishes at an economical price. Shelf-stablity makes it easy to store.